The Hastings Economic Development Corp.’s 45th annual meeting, Thursday evening at The Lark celebrated the work that colleges and school districts in Hastings are exerting to develop young talent and the future workforce . . . CCC broke ground in September 2018 for a 32,000-square-foot renovation and expansion of the Hamilton Building after the CCC Foundation met its $5 million fundraising goal six months ahead of schedule. The Hamilton Building is home to CCC’s advanced manufacturing design technology and welding technology programs . . . CCC is also working on potential partnerships for an energy technology program with companies that are either based in Nebraska or have a presence in Nebraska to train students to work in the renewable energy field in Nebraska. Read the entire article here. Photo: The wind turbine on the CCC campus that came online in December 2016 has generated 120 percent of the campus’ energy needs in its first two years. Bluestem Energy Solutions of Omaha built and owns the turbine; Hastings Utilities buys and sells the electricity – including to CCC. 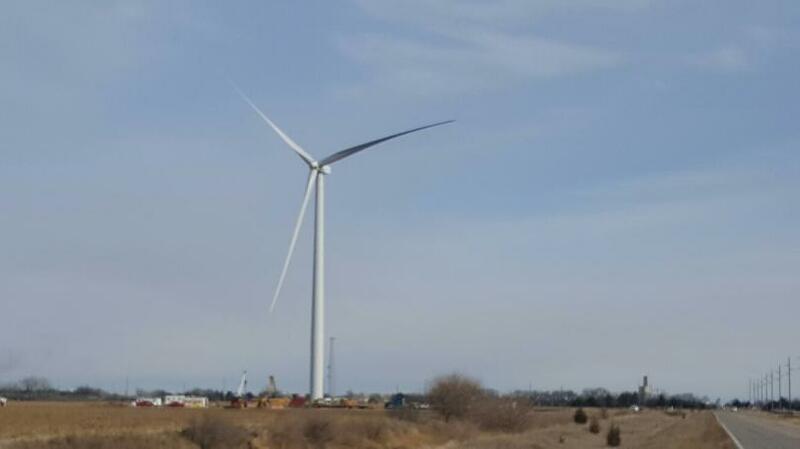 Derek Zeisler, Hastings Utilities director of marketing and energy supply: “It seems to be a good size for a good price point,” he said of the 1.5 megawatt size of the solar project, which is similar to the power generated by the Central Community College-Hastings wind turbine. This entry was posted in Green Campuses, Nebraska / Midwest News and tagged Bluestem Energy Solutions of Omaha, Central Community College-Hastings, City of Hastings, Hastings Economic Development Corporation, Hastings Tribune, Nebraska workforce development, wind and solar technology education and training programs in Nebraska on January 28, 2019 by Helen Deffenbacher.